REALITY CHECK: YOU ARE NOW BREATHING ETHYLENE DIBROMIDE, NANO-PARTICULATES OF ALUMINUM, BARIUM, STRONTIUM AND CATIONIC POLYMER FIBERS WITH UNIDENTIFIED BIO-ACTIVE MATERIAL (SYNTHETIC, LABORATORY PRODUCED “INTELLIGENT” NANO-PARTICLE TECHNOLOGY). LONG TERM CHRONIC EXPOSURE TO SUCH TOXINS DESTROYS THE BODY’S IMMUNE SYSTEM, LEAVING YOU VULNERABLE TO SERIOUS INFECTIONS, CHRONIC HEALTH PROBLEMS LINKED TO AUTO-IMMUNE DYSFUNCTION, HYBRID CANCERS, MORGELLON’S SYNDROME & PREMATURE DEATH. The program is officially named: Stratospheric Aerosol Geoengineering. An extraordinary level of secrecy surrounds the whole operation, reflecting a well-organized, coordinated international-scale “continuity of agenda” being carried out country to country; an undemocratic, scientific experiment being waged on our communities, one seemingly above/outside the jurisdiction of local government intervention, monitoring or ethical checks & balances – especially in terms of the imminent threat posed to public/environmental safety, for our generation and more so, those generations to come. 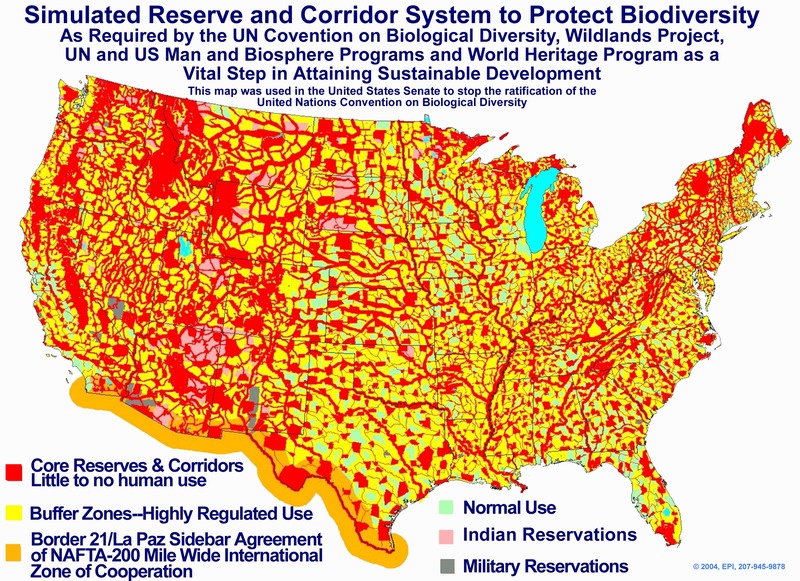 Agenda 21 will provide the mechanism needed to gain complete control over nature, societies, the natural life cycle as we once knew it. 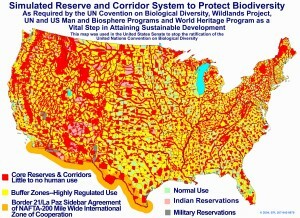 Agenda 21, once it is fully implemented, will spell the end of human access (the common people that is) to wilderness areas, the formation of Centralized “Planned-opolis” ghettos (managed by a powerful committee of Technocratic Elites), where-in the government can/will systematically determine the limits of growth via sterilization programs, the abolishing of any/all principles of self-determination of the body, a unilateral ban on organic produce, the cutting off of all natural resources ie. fresh water, clean air, literally blocking out the Sun’s Ultra Violet Rays via round-the-clock Chemtrail aerosol spray saturation of our skies with Aluminum, Barium & Strontium particulates, micro-bacterial viruses & Level 4 Bio-lab produced Nano-particle technology (self-replicating, self-repairing) – designed to overtake & weaken the Immune System. 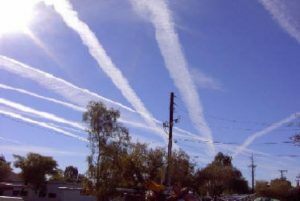 The Chemtrail program involves a convergence of Haarp & Chemtrail technologies, where-in thousands of tons of fine metal paticulates are routinely sprayed into the lower-upper Stratosphere (average 35,000 – 60,000 feet), producing an artificial barrier or shield (city-wide) which literally deflects a large proportion of the sun’s UV rays from reaching the earth, producing, depending on the geography below, a cooker-effect or a sudden cooling in temperature. Haarp (High Frequency Active Auroral Research Program) is always utilized in conjunction with Chemtrailing, to direct microwave energies (upwards of 36,000,000 watts) toward the filter, which literally heats up or supercharges the metallic “cloud surface” itself. This susequently triggers a host of abnormal weather changes throughout the entire region below, typically severe lightning storms, short-term “monsoon-like” rainstorms, prolonged overcast skies, drought and/or flooding, depending on the targeted region, if the program is continued for weeks or months on end. The Technocratic Elites who have hyjacked our Governments are triggering a deluge of floods & prolonged adverse weather conditions; while cutting all urban populations off from access to the sun’s beneficial D3 rays. White haze is now the “safe alternative” to true blue skies. This is the new phase which will auger in the coming control grid dystopia. Once all the pieces are in place and the rules of Agenda 21 are strictly enforced globally (in sync with the rolling out of a digitized, cashless economy) general health levels will plummet as the herd is “herded” into literally centralized polyopolis workcamps. Simultaneously the UN will begin rapidly locking down the vast majority of wetland areas from public use. Irradiated GMO food will replace organic food forever under this system. Expect hybrid Cancer & Autism rates etc to skyrocket exponentially. Morgellon’s Syndrome (tied to nano-particle technology embedded in the Chemtrail spray) will become the new celebrity disease of the moment. The consortium of Technocratic Elites who comprise the dominant Military, Scientific (& Medical) Industrial Complex now literally own our skies, and are routinely, systematically, deliberately messing with nature’s natural cycles (integration of Chemtrail & HAARP technologies) in order to pin the blame on man-made “Climate Change”; part of a devious, calculated “Ponzi Scheme” hatched through the United Nations (led by Globalist tycoon Maurice Strong), to use any/all anthropogenic impact on the environment (ie. Carbon Dioxide – vital to sustaining all plant/tree life on earth) as a pretext for taxing the common people back into the Middle ages, whilst imposing gradually worsening austerity measure on our communities, till the masses eventually learn to live with nothing…and grovel on our knees for Global Governance total control over our lives & Institutions. The masterfully cunning lie behind Agenda 21 involves using the contrived threat of Anthropogenic Global Warming as a pretext for systematically Chemtrailing our skies, artificially blocking out the sun’s UV rays, thereby depriving our communities of vital, life-sustaining Vitamin D3, which is causing a rapid chain reaction of environmental catastrophe, due to all the heavy metal particulate fallout contaminating our soil, rendering it unfit for growing natural produce for generations to come due to severe acidity levels & equally contaminating our groundwater on which we depend for survival, on top of all the prolonged drought & flooding which is being deliberately triggered across the board via the convergence of Haarp & Chemtrail technologies, diverting natural weather patterns by design, in order to turn traditionally fertile, local farm-land into arid desert; whereupon Monsanto moves in, buys up the land for pennies on the dollar, and begins planting its own Abiotic (crop damage) resistant GMO seeds. Check mate. All these manufactured extreme weather changes, including the environmental damage, collapsing food & waters supplies, will ultimately be blamed on Anthropogenic Global Warming – the end result of which WE, the people, will pay increasingly higher taxes and be subject to ongoing draconian austerity measures unlike anything society has witnessed since the Middle Ages. Eventually humanity will face much more punishing measures once the Global Governance Police State apparatus is fully in place, as the limits of growth will be strictly determined, by a consortium of unelected, untouchable Technocratic Elites. And this entire Machiavellian-devised operation, which was hatched decades ago in the United Nations, is going perfectly according to plan. Whether you’re willing to acknowledge it or not, your environment is being artificially engineered, your immediate & long-term health directly threatened by the ongoing imposition of Stratospheric Aerosol Geo-engineering aka chemtrailing on your community, the species itself permanently altered, and if you choose to stick your head in the sand, history certainly won’t begrudge you for it. And those criminals getting away with this attrociously illegal ongoing crime against humanity will thank you for rolling over and complying without attempting to defend your inherent rights. But in the end you will have done nothing to make a difference for future generations…let alone potentially overlooking the damaging influence your compliance with these crimes will ultimately have on your children. And by extension you will never have earned the right to stand free from tyranny and proclaim your independence. What’s so frustrating to acknowledge about the whole Chemtrail issue is the fact that none of this orchestrated destruction has to unfold as it is planned for us. We are allowing a small handful of lunatics in charge, behind the scenes, through a shadow government network that pulls the strings from the UN, Nato, Military & Air Force echelons on down through all regional departments to carry out their sick plans unhindered & without contest. It’s as though we’ve just given up and sat back in reticent compliance, because we think it’s all too complex a machinery to stop the wheels…when the truth is, we could halt this monstrous program overnight if enough of us banded together from around the world to stop it. This attitude must change or else we simply have no future whatsoever. 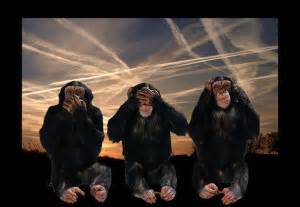 The mainstream media blackout on coverage & widespread systemic denial of the glaring Chemtrail assault of our skies around the world is one of the most shameful displays of ignorance & corruption in the history of journalism. Furthermore, most current meteorologists have no integrity whatsoever any longer, a band of liars, choosing to ignore the imminent threat posed by the ongoing Chemtrail agenda. Morgellon’s sufferers are commonly afflicted with protuberant black, blue, red or white hairy fibers which develop under the surface of the skin and grow out in pustules randomly all over the body. The texture is similar to the underside of a mattress when peeled back, extremely painful & virtually irreversible. Lesions and/or callouses form over the skin areas affected. They’re also discovering fibrous-type invertebrates, wormlike & cellulose fibers, silicon, DNA, insect pods in these victims. Morgellons fibers are sensors (artificially intelligent devices) which measure PH levels & body temperature, Blood Glucose, Blood gases & other medical conditions – laboratory produced self replicating, self repairing nano-tech machines (termed Nanoprobes). Treatment of Morgellon’s symptoms is slow, with varying results. It is crucial to maintain your proper alkalinity levels (2/3rds over aciditic) with daily maintenance – regular doses of Organic Apple Cider vinegar. For anyone in any doubt Morgellons Syndrome is very real. It is linked to Chemtrail fallout; derived from self replicating, self repairing nano-particle technology found in the spray. I met a father, during our September 2009 anti-Vaccine rally, in the late stages of Morgellons. For all intents & purposes his life is ruined. He has had to effectively isolate himself from his family like a leper due to its highly contagious nature. Since then I have come in contact with another two victims of the Syndrome, both of whom reported the same lingering symptoms. The problem is this is a very insidious disease, scientifically designed to overtake your cell structure & overall immune system. We have to find out who’s behind the program and bring them all to justice; while ensuring that chemtrailing itself is forever banned. We deserve to be left alone to live our lives naturally, not to linger in a chronically sick condition. That’s where all this is headed if we don’t fight back now. Morgellons Syndrome was developed in a level 4 Bio-Weapons Research Laboratory; it’s target…YOU. Morgellons researchers Dr Hildegaard Stanninger and Dr Karjoom have announced the finding of self replicating nano machines “running wild” in the bodies of Morgellons victims. 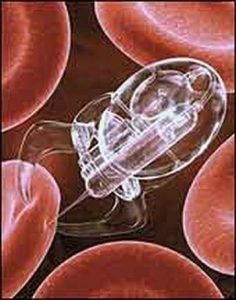 Nanotechnology represents the cornerstone of 21st Century advanced scientific research, but once again indicates a hubris & fundamental disregard for nature; and a gross miscalculation of nature’s retaliatory instinct. Natural immunity will have no place in this so called “brave new world”. The Trans-humanist Elites financing this dark revolution believe they will one day merge with the machine, in the wake of humanity’s orchestrated demise…a fate they have crafted for generations from behind closed doors, with nothing but malice in their withered hearts. Love & life will ultimately endure, and our hopes for a bright future will never be blown asunder by these misguided control freaks…and in the end Nature will once again prevail. EUGENICS RELATED BIO-WEAPONRY RESEARCH WRAPPED IN A BOW: ‘NHLBI renews programs for nanotechnology research – $65 million in contracts to help advance disease detection, delivery of therapies. The National Heart, Lung, and Blood Institute (NHLBI), part of the National Institutes of Health, is awarding $65 million to renew its Programs for Nanotechnology Research to help researchers develop tools based on materials designed at the molecular level to detect and deliver treatments for heart, lung, and blood diseases. CHEMTRAILS ARE JUST THE BEGINNING. OUR SKIES ARE SYSTEMATICALLY BEING PRIVATIZED: ‘Weather Modification, Inc., has been involved in multiple programs with the goal of identifying the potential benefits derived from the application of cloud seeding techniques. Our feasibility studies focus on the cloud structures and patterns in the project area. Gathered information assists in identifying the cloud seeding technology that’s best suited for the project. The Chemtrail Program is entirely deregulated & thus flying under the radar of standard government and/or environmental regulations. I urge everyone around the world to begin tracking all local or State/National contracts you can find which directly or indirectly link your Government to contracts with ANY of these Chemtrail product manufacturers & distributors. You may find code words such as “feasibility study” used to deceive from public notice. When you do make a direct connection please go further and raise the alarm bells. Contact a local activist group fighting to expose this ongoing heinous crime against humanity. Consider taking your information to a freelance journalist, and harass your local representative till they take notice and do something for a change. If you ever see a sun-dog solar effect when sailing the seas, you are actually witnessing a natural phenomenon common to seafarers throughout history. It occurs as a result of refracted light bouncing off the mirrored surface of the ocean, creating an ellipse or perfect rim of a circle projected back onto the sky. 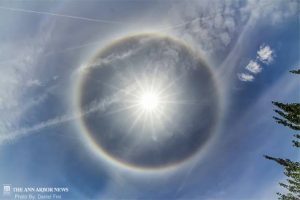 If you ever see a sun-dog solar effect occurring over your major city, however, remember that this is definitely not a natural occurrence. You are witnessing a phenomenon common to heavy Chemtrail activity, where-in the aluminum particulates laid down by the continuous spray creates an artificial shield or barrier sufficient to bounce light from the sun back onto its own metallic veil. 1. Between 1955 and 1963 planes flew from north-east England to the tip of Cornwall along the south and west coasts, dropping huge amounts of zinc cadmium sulphide on the population. The chemical drifted miles inland, its fluorescence allowing the spread to be monitored. In another trial using zinc cadmium sulphide, a generator was towed along a road near Frome in Somerset where it spewed the chemical for an hour. 2. Between 1961 and 1968 more than a million people along the south coast of England, from Torquay to the New Forest, were exposed to bacteria including e.coli and bacillus globigii , which mimics anthrax. These releases came from a military ship, the Icewhale, anchored off the Dorset coast, which sprayed the micro-organisms in a five to 10-mile radius. 3. DICE trials in south Dorset between 1971 and 1975. These involved US and UK military scientists spraying into the air massive quantities of serratia marcescens bacteria, with an anthrax simulant and phenol. 4. Similar bacteria were released in ‘The Sabotage Trials’ between 1952 and 1964. These were tests to determine the vulnerability of large government buildings and public transport to attack. In 1956 bacteria were released on the London Underground at lunchtime along the Northern Line between Colliers Wood and Tooting Broadway. The results show that the organism dispersed about 10 miles. Similar tests were conducted in tunnels running under government buildings in Whitehall. 5. Experiments conducted between 1964 and 1973 involved attaching germs to the threads of spiders’ webs in boxes to test how the germs would survive in different environments. These tests were carried out in a dozen locations across the country, including London’s West End, Southampton and Swindon. The report also gives details of more than a dozen smaller field trials between 1968 & 77. THE REAL ECHELONS OF POWER – Project MK/NAOMI: Top-Secret Project was conducted during the 1970’s in a low-income African-American neighborhood that contained several newly constructed public housing projects. Specially equipped aircraft, in one of the larger experiments, released 600,000 mosquitoes over the area (supplied by Fort Detrick). In one of the Avon Park experiments, about 150,000 mosquitoes were dropped in paper bags designed to open upon impact with the ground. Each bag held about 1,000 insects. Besides Dengue, some of the mosquitoes were also carrying Yellow Fever. CANADIAN PRIME MINISTER LOUIS ST. LAURENT (1953) SECRETLY APPROVED THE DELIBERATE, REPEATED SPRAYING BY THE US GOV’T OF ZINC CADMIUM SULPHIDE (CANCER CAUSING AGENT) OVER THE CITY OF WINNIPEG, MANITOBA: ‘In 1953, the US Government asked the Canadian Government if it could test a chemical over the city of Winnipeg. It was a big city with 500,000 people, miles from anywhere. The American military sprayed this carcinogenic chemical in a 1,000%-attenuated form, which they said would be so watered down that nobody would get very sick; however, if people came to clinics with a sniffle, a sore throat or ringing in their ears, the researchers would be able to determine what percentage would have developed cancer if the chemical had been used at full strength. We located evidence that the Americans had indeed tested this carcinogenic chemical—zinc cadmium sulphide—over Winnipeg in 1953. We wrote to the Government of Canada, explaining that we had solid evidence of the spraying and asking that we be informed as to how high up in the government the request for permission to spray had gone. We did not receive a reply. (1) Any purpose related to medical, therapeutic, pharmaceutical, agricultural, industrial, or research activity. (2) Any purpose related to protection against toxic chemicals or biological weapons & agents. (3) Any law enforcement purpose, including any related to riot control. Airline Mechanic identifies potential source of commercial plane’s Chemtrail delivery system: ‘One day last month I was called out from our base to work on a plane for another airline. When I got the call the dispatcher did not know what the problem was. When I got to the plane I found out that the problem was in waste disposal system. There was nothing for me to do but to crawl in and fix the problem. When I got into the bay I realized that something was not right. There were more tanks, pumps, and pipes then should have been there. At first I assumed that the waste disposal system had been changed. It had been about 10 years since I had worked on this particular model of aircraft. The next day I was on the company computer to look up a wiring schematic. While I was there I decided to look up the extra equipment I had found. To my amazement the manuals did not show any of the extra equipment I had seen with my own eyes the day before. I even tied in to the manufacturer files and still found nothing. Now I was really determined to find out what that equipment did. The next week we had three of our planes in our main hanger for periodic inspection. There are mechanics crawling all over a plane during these inspections. I had just finished my shift and I decided to have a look at the waste system on one of our planes. With all the mechanics around I figured that no one would notice an extra one on the plane. Sure enough, the plane I choose had the extra equipment! I began to trace the system of pipes, pumps, and tanks. I found what appeared to be the control unit for the system. It was a standard looking avionics control box but it had no markings of any kind. I could trace the control wires from the box to the pumps and valves but there were no control circuits coming into the unit. The only wires coming into the unit was a power connection to the aircraft’s main power bus. The system had 1 large tank and 2 smaller tanks. It was hard to tell in the cramped compartment, but it looked like the large tank could hold about 50 gallons. The tanks were connected to a fill and drain valve that passed through the fuselage just behind the drain valve for the waste system. When I had a chance to look for this connection under the plane I found it cunningly hidden behind a panel under the panel used to access the waste drain. I began to trace the piping from the pumps. These pipes lead to a network of small pipes that ended in the trailing edges of the wings and horizontal stabilizers. Note: Neither of these statements (airline mechanic & manager) have been independently verified. Further, actual confirmation of ‘Project Cloverleaf’ has yet to materialize in the form of de-classified Gov’t/Military documents. They have been included here-in as highly intriguing, albeit unconfirmed, records. Undoubtedly any whistleblower involved in this scale of a cover-up would likely go to great lengths to ensure protection of their identity. Therefore we can only speculate as to its authenticity. Precipitation modification: Numerous dispersal techniques have already been studied, but the most convenient, safe, and cost-effective method discussed is the use of afterburner-type jet engines to generate carbon particles while flying through the targeted air. This method is based on injection of liquid hydrocarbon fuel into the afterburner’s combustion gases. This direct generation method was found to be more desirable than another plausible method (i.e., the transport of large quantities of previously produced and properly sized carbon dust to the desired altitude). “significant beneficial influences can be derived through judicious exploitation of the solar absorption potential of carbon black dust.” If clouds were seeded (using chemical nuclei similar to those used today or perhaps a more effective agent discovered through continued research) before their downwind arrival to a desired location, the result could be a suppression of precipitation. In other words, precipitation could be “forced” to fall before its arrival in the desired territory, thereby making the desired territory “dry.”. Fog modification: ‘Field experiments with lasers have demonstrated the capability to dissipate warm fog at an airfield with zero visibility. Generating 1 watt/cm2, which is approximately the US large power density exposure limit, the system raised visibility to one quarter of a mile in 20 seconds. Laser systems described in the Space Operations portion of this AF 2025 study could certainly provide this capability as one of their many possible uses. With regard to seeding techniques, improvements in the materials and delivery methods are not only plausible but likely. Smart materials based on nanotechnology are currently being developed with gigaops computer capability at their core. They could adjust their size to optimal dimensions for a given fog seeding situation and even make adjustments throughout the process. They might also enhance their dispersal qualities by adjusting their buoyancy, by communicating with each other, and by steering themselves within the fog. They will be able to provide immediate and continuous effectiveness feedback by integrating with a larger sensor network and can also change their temperature and polarity to improve their seeding effects. As mentioned above, UAVs could be used to deliver and distribute these smart materials. Storm modification: ‘Weather-modification technologies might involve techniques that would increase latent heat release in the atmosphere, provide additional water vapor for cloud cell development, and provide additional surface and lower atmospheric heating to increase atmospheric instability. Critical to the success of any attempt to trigger a storm cell is the pre-existing atmospheric conditions locally and regionally. The atmosphere must already be conditionally unstable and the large-scale dynamics must be supportive of vertical cloud development. The focus of the weather-modification effort would be to provide additional “conditions” that would make the atmosphere unstable enough to generate cloud and eventually storm cell development. The path of storm cells once developed or enhanced is dependent not only on the mesoscale dynamics of the storm but the regional and synoptic (global) scale atmospheric wind flow patterns in the area which are currently not subject to human control. In summary, the ability to modify battlespace weather through storm cell triggering or enhancement would allow us to exploit the technological “weather” advances of our 2025 aircraft; this area has tremendous potential and should be addressed by future research and concept development programs. 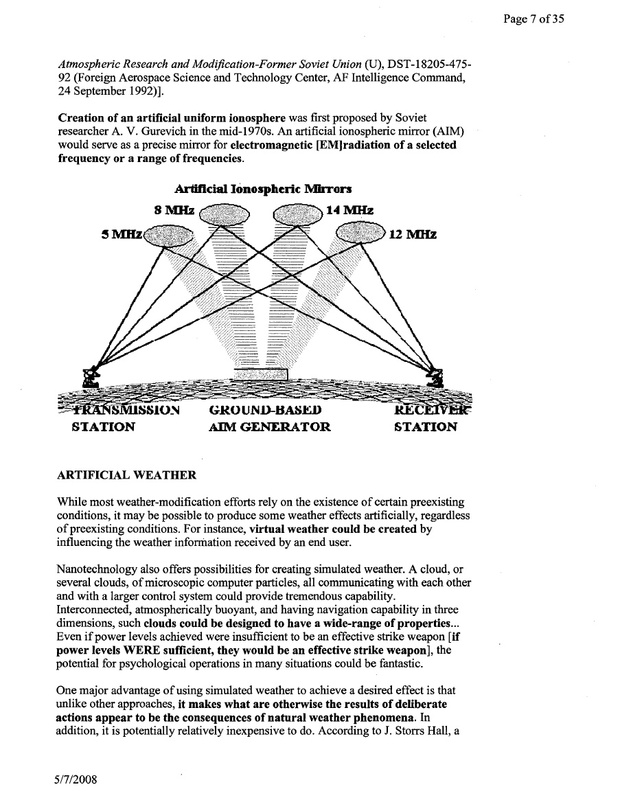 Space-weather/Ionosphere modification: ‘A number of methods have been explored or proposed to modify the ionosphere, including injection of chemical vapors and heating or charging via electromagnetic radiation or particle beams (such as ions, neutral particles, x-rays, MeV particles, and energetic electrons). It is important to note that many techniques to modify the upper atmosphere have been successfully demonstrated experimentally. Ground-based modification techniques employed by the FSU include vertical HF heating, oblique HF heating, microwave heating, and magnetospheric modification. Significant military applications of such operations include low frequency (LF) communication production, HF ducted communications, and creation of an artificial ionosphere. Several high-payoff capabilities that could result from the modification of the ionosphere or near space are described briefly below. It should be emphasized that this list is not comprehensive; modification of the ionosphere is an area rich with potential applications and there are also likely spin-off applications that have yet to be envisioned. Ionospheric mirrors for pinpoint communication or over-the-horizon (OTH) radar transmission. The properties and limitations of the ionosphere as a reflecting medium for high-frequency radiation are described in appendix A. The major disadvantage in depending on the ionosphere to reflect radio waves is its variability, which is due to normal space weather and events such as solar flares and geomagnetic storms. The ionosphere has been described as a crinkled sheet of wax paper whose relative position rises and sinks depending on weather conditions. The surface topography of the crinkled paper also constantly changes, leading to variability in its reflective, refractive, and transmissive properties. Congress reaffirms the policy expressed in section 102(a) of the National Aeronautics and Space Act of 1958 (42 U.S.C. 2451(a)), stating that it `is the policy of the United States that activities in space should be devoted to peaceful purposes for the benefit of all mankind.’. (1) The term `space’ means all space extending upward from an altitude greater than 60 kilometers above the surface of the earth and any celestial body in such space. Official Patent for Aluminum resistant gene in growing crops: ‘Sorghum aluminum tolerance gene, SbMATE The major aluminum tolerance gene, the SbMATE gene, encodes a root citrate efflux transporter that is Al-inducible at the level of gene transcription and is also Al-activated at the level of protein function. High level of expression of the SbMATE gene and the protein was found in roots. SbMATE orthologs with high degree of sequence homology were found in other higher plants, including rice. Successful transformation of Arabidopsis provides strong evidence that SbMATE can work across species to enhance tolerance to Al in other important crops grown in localities worldwide where Al3+ cations are present in acid soils and are toxic to plants. 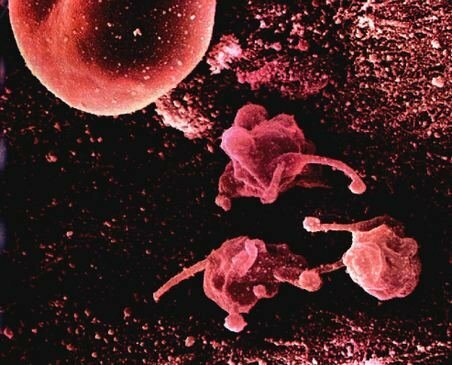 CELL BASED NANO MACHINE : CAN SELF REPLICATING NANO MACHINES INFILTRATE PEOPLE? I recommend you research this for your own city/area. Chemtrail fall-out is routinely showing up in our drinking water. In many cases it is being added directly by design. Google the most recent Official Water Quality Report for your region. You DON’T want the homogenized version given to the public for show. You want the official, annual version shared by companies & those in office. You have the right to know. After all we’re bathing in it & drinking it every day. And remember you absorb more heavy metals & chemicals through bath vapor than via the taps. STRONIUM: An alkaline earth metal, strontium is a soft silver-white or yellowish metallic element that is highly reactive chemically. The metal turns yellow when exposed to air. It occurs naturally in the minerals celestine and strontianite. The 90Sr isotope is present in radioactive fallout and has a half-life of 28.90 years. Pure Strontium metal is obtained by reduction of strontium oxide at high temperature and under vacuum. Strontium metal (99% min purity) is used for the production of Aluminum-Strontium master alloys. 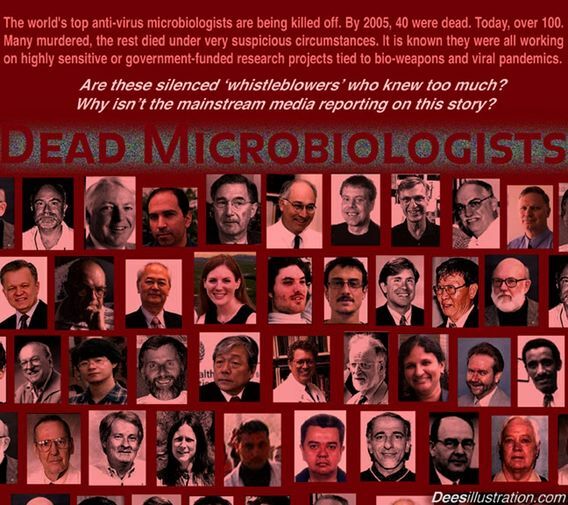 November 12, 2001: Dr. Benito Que, a cell biologist working on infectious diseases, was found beaten to death outside his laboratory at the Miami Medical School. No arrests and no suspects. November 14, 2001: Dr. Don C. Wiley was one of the world’s most highly renowned biochemists who worked at Harvard. His car was found in the middle of the Mississippi River Bridge, with the engine running. Thirty-five days later, Dr. Wiley’s body was fished out of the river, 300 miles south of where he vanished. No arrests, no suspects. November 23, 2001: Dr. Vladimir Pasechnik, a former microbiologist for Biopreparat, the Soviet biological-weapons production facility, was found dead of a reported stroke in Wiltshire, England. Dr. Pasechnik defected from the Soviet Union in 1989. His revelations about the Soviet Union’s production of such biological agents as anthrax, plague, tularemia and smallpox provided an inside account of one of the best kept secrets of the Cold War. December 10, 2001: Dr. Robert M. Schwartz was found stabbed to death by an intruder in Leesburg, Virginia. Dr. Schwartz was a well-known DNA sequencing researcher. He founded the Virginia Biotechnology Association where he worked on DNA sequencing for 15 years. December 14, 2001: Microbiologist Set Van Nguyen, a 15 year employee at the Commonwealth Scientific and Industrial Research Organization’s animal diseases facility in Geelong, Australia. Nguyen, 44, appeared to have died after entering an airlock into a storage laboratory filled with nitrogen. Colleagues consider his death extremely suspicious. February 8, 2002: The head of the microbiology sub-faculty of the Russian State Medical University, Victor Korshunov was found dead of blunt trauma head injuries in the entrance of his house in Moscow. No arrests, no suspects. February 16, 2002: Dr. Ian Langford was found dead at his blood-spattered and apparently ransacked home. Langford was a Senior Fellow at the University of East Anglia’s Center for Social and Economic Research on the Global Environment (UK), was discovered by police and ambulance men. 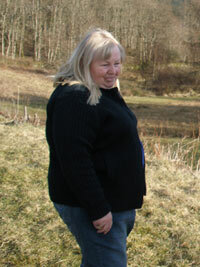 The body was naked from the waist down and partly wedged under a chair. No arrests, no suspects. February 27, 2002: Dr. Tanya Holzmayer, a pioneering scientist, murdered by a former colleague, Guyang Huang. He shot her when she opened her front door of her Mt. View, California home. Mr. Huang then conveniently killed himself. Both were found shot to death, case closed. The only witness was a pizza delivery man who worked for a non-existent pizza place. Dr. Holzmayer was a former Russian genome scientist who had co-invented a tool that has helped find hundreds of molecular targets to combat cancer and HIV. March 24, 2002: David Wynn-Williams, an award-winning microbiologist died when he was struck by a vehicle while out jogging. Considered one of the world’s top biologists, Wynn-Williams had assessed the capability of microbes to adapt to environmental extremes, including the bombardment of ultraviolet rays and global warming. March 25, 2002: Denver, CO, Dr. Steven Mostow died in a small plane crash. Dr. Mostow, 63, was one of the country’s leading infectious disease experts and was Associate Dean at the University of Colorado Health Sciences Center. Mostow was an expert on the threat of bio-terrorism. No cause of crash determined. October 11, 2003: West Nile researcher, Dr. Michael Perich, 46, died in a one-vehicle car accident. From 1986 to 1992, Perich worked at Fort Detrick in Frederick, Md., as the vector suppression program manager and research medical entomologist. The anthrax used in the US attacks originated at Fort Detrick. November 2, 2003: Vladimir Pasechnik defected from the Former Soviet Union to Great Britain while on a trip to Paris. He had been the top scientist in the USSR bioweapons program, which is heavily dependent upon DNA sequencing. In the last few weeks of his life he had put his research on anthrax at the disposal of the British and US governments, in the light of the threat from bioterrorism. The cause of the death was certified as a stroke. But it has emerged that a pathologist attached to MI5, Britain’s internal security service, examined the body. His findings are not known. “There are a number of nerve agents that can mimic a stroke and leave no traces,” said Dr. Leonard Horowitz, a US specialist in the field of toxic poisons. November 20, 2003: Robert Leslie Burghoff, 45, a postdoctoral fellow at Baylor College of Medicine’s molecular virology and microbiology department in Houston, was walking to his car Nov. 20 when he was hit from behind by a white or light-colored cargo van that jumped the sidewalk in the 1600 block of South Braeswood. He was killed instantly, no arrests, no suspects. January 19, 2004: Dr. Robert E. Shope, one of the world’s top experts on viruses and infectious illnesses, died in Galveston. The cause was listed as complications of a lung transplant In the last two years, Dr. Shope worked on a Defense Department project to develop antidotes to viral agents that terrorists might use. March 11, 2004: Vadake Srinivasan, originally from India, was one of the most-accomplished and respected industrial biologists in academia, and held two doctorate degrees. He died in a mysterious single car accident in Baton Rouge, La. May 14, 2004: Dr. Eugene F. Mallove, 56, died after being beaten to death during an alleged robbery. Dr. Mallove had a broad experience in high technology engineering for government agencies and the military at companies including Hughes Research Laboratories and MIT. June 16, 2004: William T. McGuire , 39 , of Woodbridge, N.J. His dismembered body was found floating in three suitcases in the Chesapeake Bay last month. McGuire was a senior programmer analyst and adjunct professor at the New Jersey Institute of Technology in Newark. Don’t believe in chemtrails? Watch this! Until a few years ago, I too was unsure about the existence of Morgellons. I was confused whether this condition really existed or not. Though, I was astounded to read that Morgellons is in fact part of Chemtrailing. If the reports are anything to go by, then cases of Morgellons are only going to increase in number. Perhaps this is the reason such a powerful and life altering disease has been overlooked for so long. There is a main-stream media blackout on this subject so the only way to get the word out is by word of mouth. People are already dying because of the chemtrails. Life expectancy is down. This situation presents an immediate and serious threat to you, your family and loved ones. We must join together to stop this insane program of chemtrail spraying now. Please do what you can to help. It seems like we have no rights at all. Even in the face of exposure we are being led to the slaughter. How can we stop this. No one is listening. 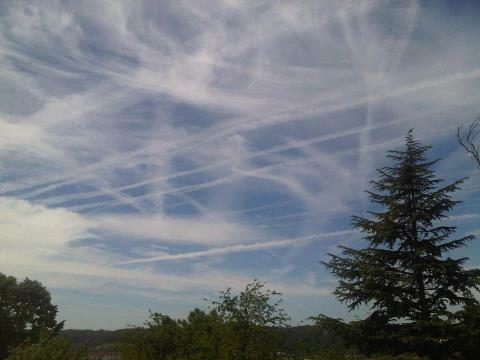 So, do we know the source of these planes that are spraying? Where are they taking off from and returning to? Morgellons IS eerily similiar to the video game HALO, made by microsoft, it has the parasites, the nano chips, the sores, the hair falling out, and the colored fibers, when a military guy on the game gets infested w/ one, they multiply, take over the host, because the chips r programmed and they start turning into REPTILIANS! crazy but true, my 8 year plays this game & told me all about today, so i checked it out, and he was right on, they even have videos of it on utube!Very strange how “exact” to morgellons it is, even down to the parasite which they call FLOODS. You can google pic of HALO flood and u can see the parasites, the nano chips and the men being taken over by them! Morgellons is a systemic disease that has not yet gained widespread acceptance in the medical community, yet it actually exists just as AID/HIV existed 30 years ago before Medical science recognized it. It is similar to scabies, which is a contagious skin disease in which parasites burrow under the skin and lay eggs. These parasites belong to the arachnid family. Symptoms vary from one patient to another. Others, such as skin lesions and a “crawling sensation” in the skin are consistent. Areas of the body where the disease seems to be most severe are on the hands, behind the knees and arms, on the chest and back. Other common physical symptoms are rashes and pain that is similar to fibromyalgia. Severe depression often leading to suicide is all too common. The Morgellons Research Foundation located at Oklahoma State University, has identified 93 symptoms common to Morgellons sufferers. A complete list of these symptoms from the Morgellons Research Foundation can be viewed along with their complete case definition for medical professionals. When seeking medical help from MD’s and Dermatologists, Morgellons sufferers are nearly always diagnosed with Delusions of Parasitosis (DOP). Currently, there is no known test for Morgellons disease so patients are always told “it is all in your head” and are prescribed physo-tropic drugs and occasionally antibiotics. Neither provide any relief whatsoever from these horrible symptoms. The patient’s families often believe the doctor and withdraw their support. Morgellons patients begin to feel hopeless and continue their descent into severe depression, too often resulting in suicide. Many patients have reported trouble concentrating while constantly experience fatigue. 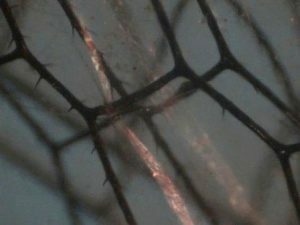 When affected areas are viewed under a microscope, many Morgellons patients have clusters of multi-colored fibers beneath their unbroken skin. 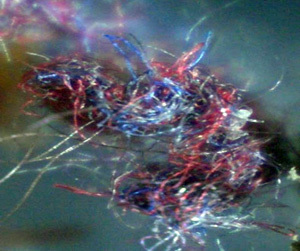 These fibers may or may not be visible with the naked eye. The fibers have been tested in several labs. They will not burn until they reach 1,400 degrees Fahrenheit and are covered in some sort of high-density polyurethane. A recent study has found microscopic parasites in some patients. This parasite is known to feed on algae, bacteria and decaying organic materials. They thrive in wet or damp surroundings. Unfortunately, there is no meaningful research being conducted since the Morgellons population, while increasing daily is still statistically insignificant. It is common knowledge that Morgellons is most prevalent in the USA, Canada, Europe, Australia and New Zealand and spreading rapidly. Morgellons sufferers often report black ‘specks’ like pepper on their bed sheets upon waking in the morning. In the previous 6 years, over 40 United States Senators have written letters to the CDC asking them to investigate this bizarre disease. After 4 years of waiting, in 2008 the CDC began their investigation at Kaiser Hospital in Oakland, California. The results are inconclusive as to the cause of Morgellons Disease. The Centers for Disease Control refers to it as an unexplained dermopathy. Many dermatologists and psychiatrists consider this a psychological disorder, rather than a physical disease. Medical doctors generally treat the condition by prescribing antibiotics, antifungals or herbal supplements. These methods are considered treatments rather than cures, as the symptoms return when discontinued. Colloidal silver has been marketed as an alternative medicine for this condition as well as many others, from fibromyalgia to E. coli. From a medical standpoint, there is no proven effectiveness for this treatment. Until now, that is. Regardless of official reports, many Morgellons sufferers have found relief when NutraSilver is used. They state that the lesions begin to heal after a week, with the sores dissipating completely within three weeks. The severe cognitive issues generally resolve in about two weeks. The bouts of stinging and biting sensations that plague sufferers are reduced or disappear altogether. The most severe symptoms are debilitating and in many sufferers, their quality of life is reduced. When taken as suggested, these fortunate Morgellons sufferers actually get their lives back; their energy returns, their brain-fog reduces and they begin to feel like themselves again. For more information and testimonials from actual Morgellons suffers, visit the web site. Morgellons suffers are selectively being treated disrespectfully by the established medical community. They are being rejected just as AIDS/HIV victims were treated 25 years ago when that disease first cropped up. Morgellons victims are suffering tremendously and their suffering is real. They must be treated with respect and decency and compassion if we are ever going to get to the bottom of this mysterious disease. Only then will they be hopeful and encouraged to continue their battle with this unknown and debilitating disease. January 26 2010 Daily Record writes ‘Air, soil, water being “poisoned”‘. February 4 a petition is published on PetitionSite ‘Investigate Persistent Contrails AKA Chemtrails’. February 7 2010 Nolan Chart publishes ‘Chemtrails over the Ozarks–why ask “why”?–“Why” ask I!!!…’. 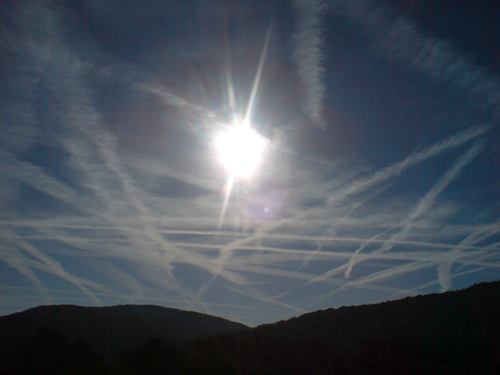 February 14 Nolan Chart writes ‘Chemtrails — In Retrospect…’. February 20 Science Now writes ‘Smattering of Activists Protest Geoengineering, ‘Chemtrails”. December 3 2009 TheoryPedia writes ‘Chemtrails: Gov’t is secretly spraying citizens’. December 4 FTO publishes ‘Low flying planes in Cape Town at night time’ and ResistNet writes ‘“Chemtrails” Conspiracy vs theory?’ and FTO publishes ‘All is not well in the Ukraine – Spraying in Russia by airplanes’. December 6 12160.org writes ‘Killer Chemtrails: The Shocking Truth’. December 9 12160.org writes ‘The day I started to die’. December 14 Truth y Dissent writes ‘Chemtrails on History Channel’. 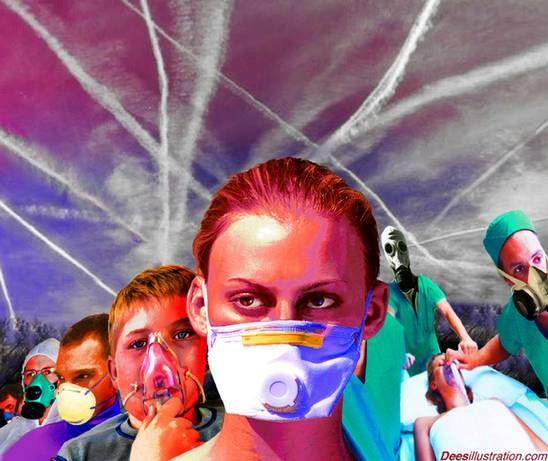 December 25 Silenced Majority Portal publishes ‘Black Cherry Blues, Featuring “Chemtrails”‘. 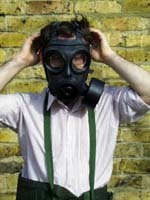 November 3 2009 The Daily Mail publishes ‘Watching the skies for an H1N1 connection’. November 7 Natural News writes that ‘Morgellons symptoms are caused by the introduction of the controversial chemtrail programs’. November 8 FTO writes ‘Trail leading to Pneumonic plague in Ukraine involved “chemtrails” or mysterious spray, fears of vaccine’. In 2009 educate-yourself.org writes ‘we have created a cheap, portable and easy-to-build device that consistently destroys Chemtrails and heals the atmosphere’ and Wikipedia publishes ‘The chemtrail conspiracy theory holds that some contrails are actually chemicals or biological agents deliberately sprayed at high altitudes for a purpose undisclosed to the general public’. September 15 2009 the RickmarkSentinel writes ‘Environmental warfare is defined as the intentional modification or manipulation of the natural ecology, such as climate and weather’. September 24 The Chicago Tribune publishes that ‘some are said to contain bio-agents designed to sterilize targeted ethnic populations or deadly pathogens like H1N1, so pharmaceutical companies can raise their bottom lines by selling vaccines’. On October 1 2009 NatureNews publishes ‘let`s not forget chemtrails and bio-terror experimentation on our home soil’. October 29 the Los Angeles Times writes ‘2012: The disaster filmgoers can’t wait to happen’.